There’s so many hilarious things about this map. First time I see a show with a geopolitics map where not only they didn’t leave out Africa out of every union like if we didn’t exist, but WE ACTUALLY CONQUERED EUROPE. 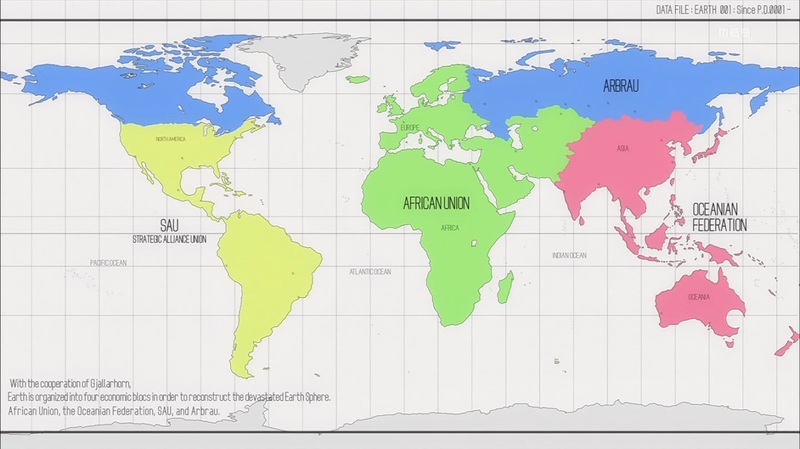 I remember that one map in Valvrave made me mad because Africa wasn’t left out, but was cut in three between the three superpowers, cut like a cake, like if it was colonialism all over again. There’s no room for doubt too. USA and South America probably allied themselves since the name is just “Strategic Alliance Union”. Meanwhile all of Africa, most of Europe and the Middle East is called AFRICAN UNION. African countries joining together, getting over our differences, hand in hand. Free of Total, Areva or Shell. Free of dictators backed by France and others. We niggers finally got our revenge on colonialist scum. We steamrolled everything, including Israel’s army. IBO worlds’ Earth must be the best place ever to live. God bless Sunrise, Okada Mari, and whoever decided on this map. In case you’re interested, I’m busy these days so can’t finish writing pretty rhythm news stuff for now. You can check yourself for now on the movie’s official site, they published on the 26th the characters’s profiles. There’s only the picture of one new character for now though. ANN doesn’t know pretty rhythm has always been for both little girls and fujoshis and everyone. Though I guess they never showed the girls naked like that, and stuff like that is definitely part of the pandering system which I don’t like. But then again, it’s fun and over the top so I can manage to not mind it too much. A few Jp fans on Twitter say this isn’t Pretty Rhythm and are unhappy about the naked boys. Note that I’m talking about people unhappy about the picture, not people who are butthurt about the movie itself. The picture is hilarious but I guess I do agree with them. There was the onsen episode in the show, but the boys were well, at a onsen, so it’s normal they’re naked. While here it’s a promotion picture. So I can see what they mean. This entry was posted in Gundam Iron Blooded Orphans, Opinions on... and tagged Anime, Gundam Iron Blooded Orphans on October 25, 2015 by rockmanshii.